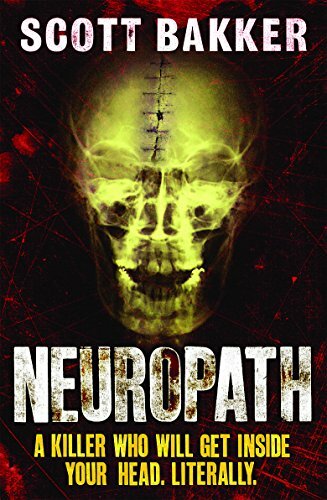 Like it or not, one thing is certain: Neuropath is a book about Big Issues. And not the usual ones. If the idea of a novel whose plot and emotional center are both grounded in the latest research in the neurological basis of consciousness sounds exciting, then you should probably ignore the rest of this review and read the book. If it sounds like I’m being sarcastic, I’m not. It sounded exciting to me and I read it for that reason. So if you’re interested, go ahead, because novels about consciousness are pretty thin on the ground. I almost feel obligated to support the book, just to encourage more writers to have the courage to tackle interesting (and very difficult) issues. Unfortunately while as I’ve just made clear I admire the book a great deal, I also feel obligated to say that I didn’t enjoy reading it and suspect most potential readers won’t either. What went wrong? From the beginning, Neuropath is playing defense. Before the book begins there’s an author’s note saying that although it is fiction, the novel is “based on actual trends and discoveries in neuroscience, psychology, and cognitive science”. Obviously this was included because Bakker or his editor felt that much of the actual science in the book will not be recognized as such. This is an unusual problem for a science fiction novel. Instead of the usual suspension of disbelief, Bakker is trying to achieve something else, uh, I guess an animation of belief? I’m guessing that, for this material at least, it’s going to be a lot harder for the reader to be lead towards belief instead of away from disbelief. I can’t say for sure: I came into the book at least somewhat familiar with the research that Bakker based it on so I didn’t really need any hand-holding. But throughout the novel I could see the author straining to be convincing, walking the reader through this or that difficult element of modern cognitive science and trying to anticipate and then address objections. If you’re read very much science fiction you probably think I’m saying there’s a lot of infodumps, since they are an ever-presence scourge particular to science fiction and fantasy. And yes, info gets dumped. But normally books just dump the info and move on, and as long as it is kept within reasonable limits most of us have learned to deal with it. Here, because as I’ve said the author assumes (correctly I think) that the info he’s dumping isn’t likely to be believed, you end up with these Socratic dialogue infodumps where The Layperson goes back and forth with the Scientific Authority, slowly being led to question their assumptions and glimpse the truth. Bakker does the best he can to smoothly place these within his narrative, but these exchanges feel utterly out of place in a thriller. I haven’t mentioned until now that this is a thriller, because it’s not. Oh, it wants to be. See, the book is about a neurosurgeon-turned-serial-killer who is old friends with the protagonist, a psychology professor, and…well, mileage varies, but I found it all fairly derivative. After Silence of the Lambs, Se7en, etc. I’m pretty burned out on serial killers. But really, this just isn’t a thriller. I don’t know anything about how Bakker came to write this book, and certainly I could be totally wrong, but my impression is that for Bakker the science came before the story. He wanted to write a novel that contained the science, so he pieced together a thriller story as best he could around the Socratic exposition he’d need to explain the facts. And the thriller is not very good. For one thing, it is crowded out by the science, which gets the lion’s share of the book’s emphasis, so there’s just not a lot of space to develop either the plot or the characters. For another, the expository nature of the scientific sections undermines the tension and sympathy the thriller needs to work well. And finally (but this is the least important issue) the nature of the science itself tends to undermine sympathy with the protagonist. I don’t really blame Bakker for this, or rather, having set out on this course I don’t know if there was much he could have done differently. Science fiction is great for showing the implications of science, but I don’t think it’s a very good vehicle for science itself. Non-experts must judge scientific claims based on the authority of the one making the claim, and fiction writers, to put it bluntly, are professional liars. Even though Bakker has twisted the story into contortions for the benefit of the science, much to story’s detriment, he’s still working in a literary tradition in which the usual practice is to twist the science into contortions for the benefit of the story, much to the science’s detriment. Still, Bakker should be saluted for aiming high here, and the maybe some will find the result more enjoyable than I did. For people interested in what modern neuroscience is learning about the mind, I recommend V. S. Ramachandran’s surprisingly readable non-fiction book Phantoms in the Brain, which I suspect was a major source for Bakker. As time goes on hopefully the readership will get to the point where SF novels incorporating this kind of work can be novels first.